St. Claude Avenue has emerged as a New Orleans hotspot for locals and tourists alike, attracting visitors with a string of art galleries, dance clubs, live music and restaurants. The St. Claude neighborhood, also known as the Upper 9th Ward, has become a mecca for fringe artists and performers seeking to align themselves with a more “authentic” version of New Orleans. The neighborhood includes the attractions of St. Claude Avenue, as well as plenty of residential space within its interior. It’s one of the oldest parts of the city, and much of it remains largely unchanged, offering charming historic housing stock for a fraction of the price. It’s an up-and-coming area that, given its slate of younger residents, thriving art scene, and recent press, some might argue has already made it big. St. Claude is a subdistrict of the Bywater District, which has also garnered national attention for its recent renaissance. St. Claude’s boundaries, as defined by the City Planning Commission, include: Law, Montegute and North Galvez Streets to the north, Lesseps Street to the East, Burgundy Street, Clouet Street and St. Claude Avenue to the south, and Franklin Avenue to the west. In colonial times, the area consisted mostly of plantation land, with residential development starting in the first decade of the 19th century. The area was known as part of the predominantly French “downtown” section of New Orleans. Soon, St. Claude welcomed settlers from Spain and the French Caribbean, and, later in the century, white and mixed-race Creoles, as well as immigrants from Germany, Italy and Ireland. The neighborhood began attracting artistic communities in the late 1990s. 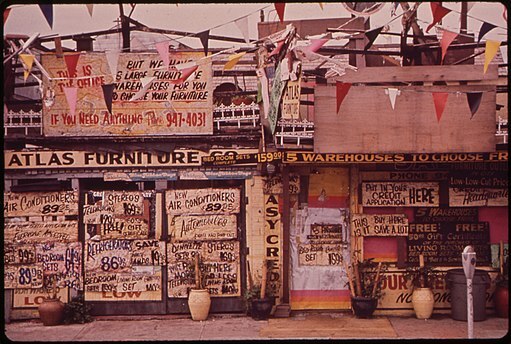 Pre-Katrina, St. Claude Avenue was a gritty street populated by furniture stores and a smattering of oddball shops. The neighborhood was working-class and predominantly black. Post-Katrina, it’s a mix of flood-ravaged homes, trash-littered streets, and higher-ground areas containing well-maintained, historic homes and changing demographics. The high ground section on the Mississippi River side of St. Claude Avenue escaped significant flooding, as did areas on the Gentilly Ridge and along the lakefront fill. Other areas contain strings of uninhabitable, abandoned homes. The Desire streetcar line, made famous by Tennessee Williams’ play A Streetcar Named Desire, links St. Claude with the rest of the city. Bywater and St. Claude are often referred to as the “old neighborhood,” by locals who lament the ongoing trend of gentrification. St. Claude is a mix of old and new. It’s still home to gritty streets and general ruin, yet hipsters, artists and bohemians have flocked there, rehabbing old homes, driving up prices and opening the city’s hippest cafes, galleries and wellness studios. No longer a fringe phenomenon, St. Claude is becoming a universal destination, earning mention in nearly all of the city’s press. The Musicians’ VIllage: An artist’s community designed to aid local musicians and preserve the city’s culture following Hurricane Katrina. Ellis Marsalis Center for Music: Facility serving at-risk children, youth and musicians. St. Claude Arts District: An artist-run arts district comprised of over two dozen collectives, co-ops and pop-ups along St. Claude Avenue. New Orleans Healing Center: A community center featuring a fitness center, art galleries, a yoga studio, a voodoo shop, and more. Dancing Grounds: A dance studio offering dance classes and community youth programs. The New Movement: An improv and sketch comedy theater offering fresh shows seven days a week. N7: Elegant French wine bar named one of the 10 best new restaurants in America by Bon Appetit. Sneaky Pickle: A highly rated vegan restaurant using locally-sourced ingredients. Junction: A tavern serving over 40 beers on tap and fancy burgers. St. Coffee on St. Claude: A highly regarded cafe serving great coffee, vegan snacks and herbal concoctions. Saturn Bar: A dive bar that showcases alternative bands, guest DJs and dance parties. Expect for St. Claude to continue to grow in popularity as it takes a central position in NOLA’s art scene and tourism.